Sounds like a set-up in need of a punchline? Chloe–a fluffy muppet of a goldendoodle dog with a nose for adventure and an ongoing obsession with a yellow tennis ball. Jenise–Chloe’s dog mom and sidekick whose favorite adventures are any that include her muppet pup. She fully supports her kiddoodle’s obsession for yellow tennis balls. The two share endless games of fetch. A whole new world (and a pet-loving adventure) begins after Jenise is laid off from her 27-year career as an innovator and strategist at Hallmark Cards. In the blink of an eye, her world is rocked. But with Chloe by her side and through the support of her family, she decides it’s time to reinvent herself–and to put her energy into a business of her own. Through freelancing and consulting, she begins to rebuild. As she works, Chloe patiently waits by her side until it’s time for a break­–a game of fetch or two or three or four. 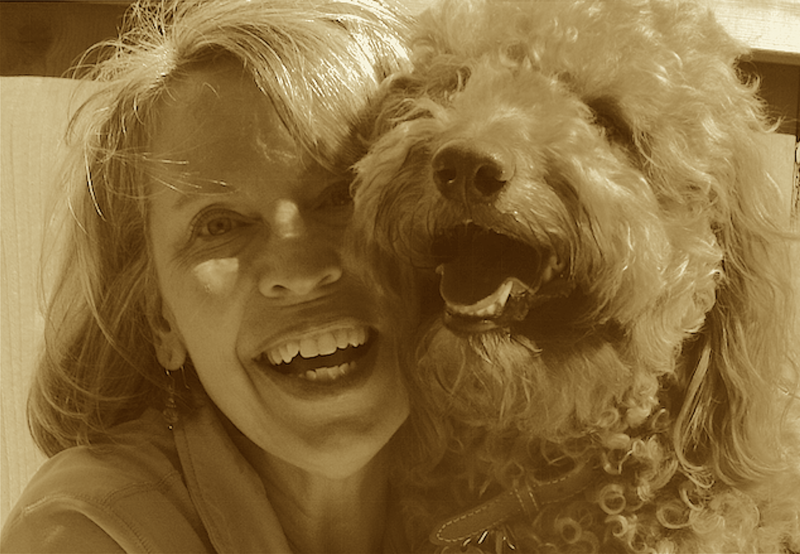 It’s during those moments of companionship, that a new adventure ignites…and the two become the hands and paws behind the vision for Happy-Go-Doodle, a blog and brand founded in sharing as much joy with others as Chloe shares with everyone she meets. 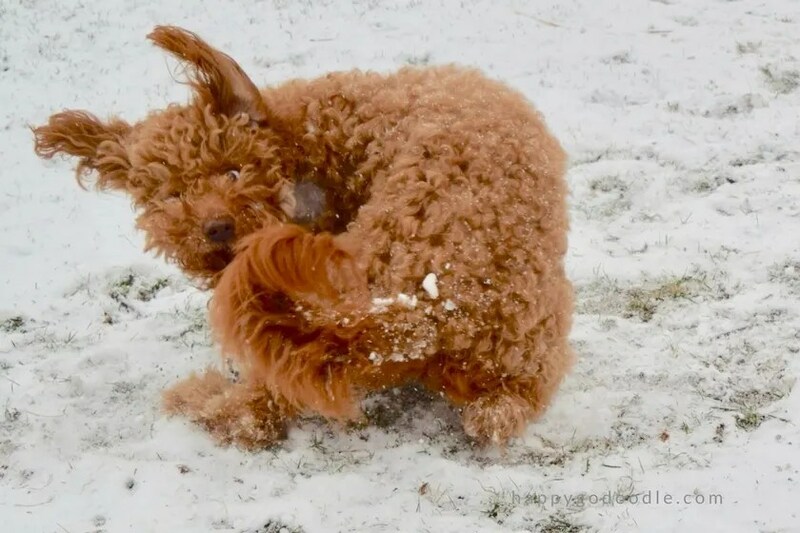 “Wordpress and keyword strategies and how to grow an email list…and what’s affiliate marketing, anyway?” Self-doubt swirls around in the girl’s head like a goldendoodle doing zoomies in the first winter snow. Chloe’s happy-go-lucky attitude helps Jenise press on–along with her discovery of another joy: a social learning community called BlogPaws. Through a Google search, BlogPaws pops up at the top of the search results. Like a dog sniffing out a treat hidden under the couch cushion, the girl joins BlogPaws–a premier social media company, a gem of a pet-loving community, a wealth of social media/blogging education, and a gold mine of new connections with pet-loving people, pet brands, and a friendly BlogPaws staff. And all of this culminates in a yearly pet blogging and social media conference. With some coaxing from her family, she attends the BlogPaws 2017 conference in Myrtle Beach. From the moment she steps off the plane in Myrtle Beach, the connections with cool people begin. Through conversations with bloggers, brands, influencers, and speakers, the girl’s (and Chloe’s) new future begins to unfold. …and even more love for pets and the people who love them. Well, this story is still in the works as the girl and her dog set off on more blogging adventures together. But the next chapter will be written at the 2018 BlogPaws conference in April! What will BlogPaws do for you? 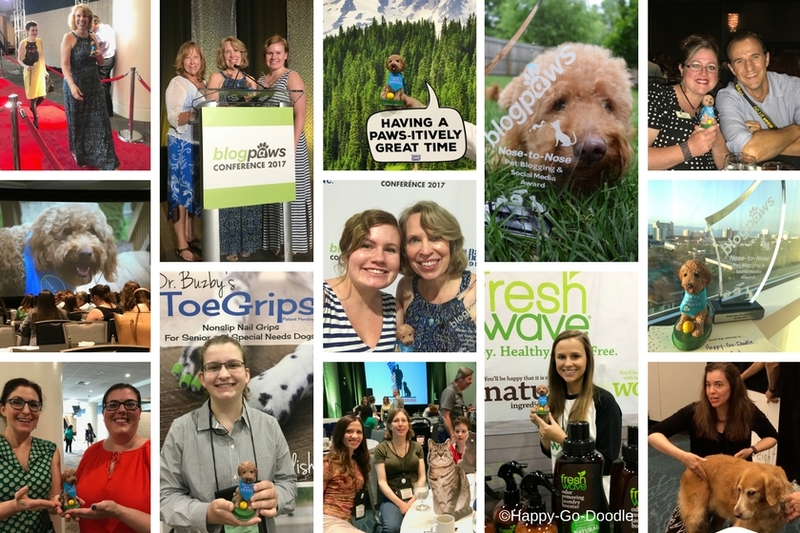 We hope our BlogPaws story offers a little inspiration to you and insight into what the BlogPaws conference is all about. Wherever you are in your life journey or in your pet-loving adventures, BlogPaws could be the spark that ignites something new for your too! 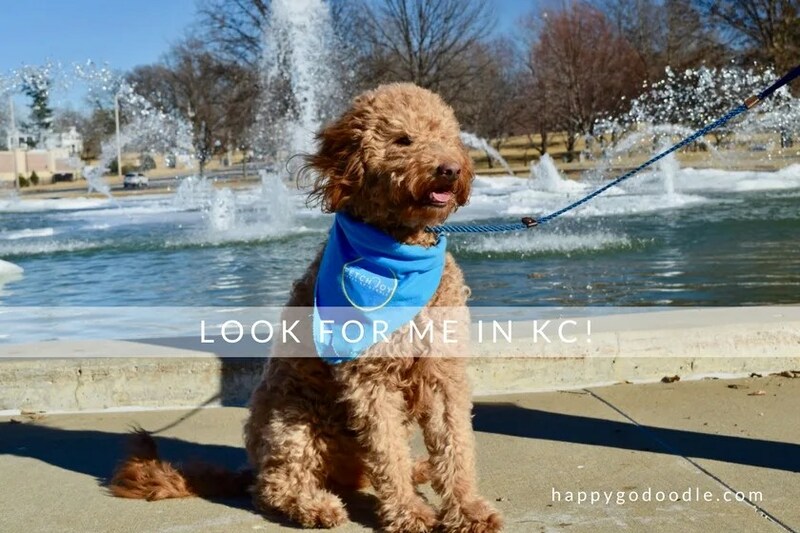 We hope you’ll join us at the BlogPaws 2018 Conference in our hometown of Kansas City, Missouri! 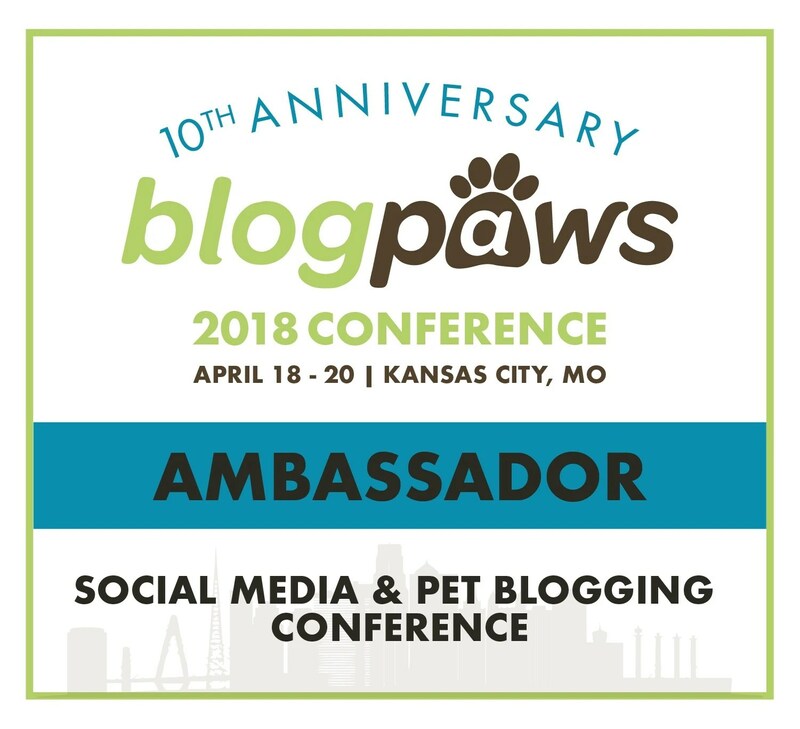 WE’RE HAPPY TO BE BLOGPAWS 2018 CONFERENCE AMBASSADORS! You can read the BlogPaws 2018 Ambassador bios here. Additionally, as the BlogPaws Speaker Ambassador, I’m excited to help share news about the great line-up of sessions and to help the speakers feel welcomed to the BlogPaws community and conference! 2. When is the BlogPaws 2018 Conference? Where is it? 3. What makes BlogPaws unique? Plus, this year marks BlogPaws’ 10th conference anniversary! It will be an epic celebration of ten years of loving pets and bringing people together! It will be a special celebration that’s bound to become a happy memory for a lifetime! It’s easy. You can register here and then look forward to all the new adventures that are about to begin for you! Once you register, BlogPaws will make sure you have all the information you need–and as an attendee, you’ll get to hear all the latest news first! Don’t wait or hesitate! There are a limited number of tickets and we don’t want you to miss out. 5. How can I learn more? 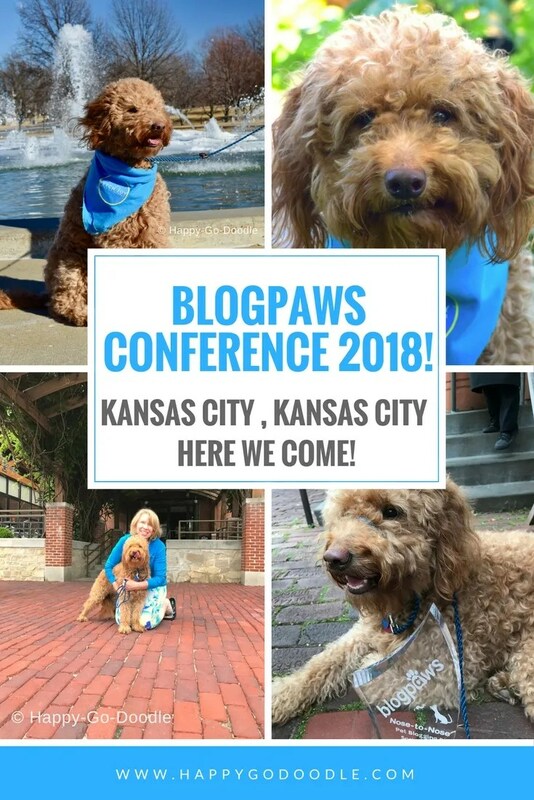 Find out more about the BlogPaws 2018 Conference in Kansas City, MO right here! Ready to write a new chapter in your pet-loving story? Then the 2018 BlogPaws conference is right for you! We hope you’ll catch all the BlogPaws conference happiness along with us! Doodle kisses and tail wags! Have you attended a BlogPaws conference? How has BlogPaws positively impacted your life? We’d love to hear! Please comment below! Do you have questions about this year’s BlogPaws conference? Please comment below. We’ll do our best to answer your questions or to direct you to someone who can! What a fantastic post! I’m really looking forward to seeing you in Kansas City. I’m so glad BlogPaws had such a profound effect on your life. It can definitely a life-changing experience if one takes full advantage of it. Awww…thanks so much! I’m looking forward to seeing you too! Who know what this year’s conference will bring! So exciting! I had an amazing time last year, and I’m really looking forward to this year’s conference too! I’ll rep both Colorado Pet Pantry and The Rufus Files, but Rufus is staying home. I *might* bring Sophie- we’ll see. So many dogs impressed me last year with their good behavior, I worry that Sophie would be too wiggly for that many people. Happy to hear that you’ll be at the conference! I’m looking forward to seeing you! Ahhh I LOVE your photos from the conference! I so wish I could go this year, but I’m definitely making it happen in 2019. Can’t wait to see everyone’s adventures during the event! Thanks! We’ll be sharing photos and information during the conference on Happy-Go-Doodle’s social media. But if you change your mind and decide to come to KC, it would be fun to meet you! So, I’m a very new blogger and of course the self doubt swirls daily! Another blogger suggested I go to the conference and since I’m only two hours, I’m definitely considering it. Then the introvert in me is screaming: “you have to network,” “you don’t know anyone!” “You have to talk to new people,” there will be a lot of people.” Luckily, your post makes it sound worth all the insecurities and doubt. I can do this! I have so much to learn about blogging and I’m so hopeful for the journey it could be! I’m so glad you stopped by and read the post! Yes, the conference is definitely worth it! Once you get to the conference and see all the adorable pets and friendly people, the doubts dwindle. You can do it and have fun too! If you have any questions, please let me know. Happy to help! We can’t wait to meet you in Kansas City. It is going to be so much fun and we will all learn such a lot. Our flights and hotels are booked and now, we wait for the day!!!! Good luck and conCAtulations. Make sure you introduce yourself. I nearly missed a couple of our Ambassadors the year I was International Ambassador from New Zealand!!! Thank you! We’re looking forward to meeting you too! I understand what you mean about nearly missing folks! There’s so much to do and so many people to meet! We will make sure to introduce ourselves! Isn’t it amazing how one door closes and another one opens? I was in a similar situation last year and was only blogging a few months before I attended BlogPaws in Myrtle Beach. The people (and pets) are amazing and it should not be missed. Especially the 10th anniversary conference.I’m looking forward to chatting with you a little more this year. Yes, so true. Step through the door and new adventures await! I’m looking forward to chatting with you more this year too! And congrats on being named a BlogPaws conference speaker! Aw what a great story! I’m looking forward to meeting you! It will be my first time attending. I love how you explained the benefits of the conference. You’ve reminded me to announce it to our readers as well that I’ll be in attendance and speaking! Thank you! Congratulations on being chosen as a speaker! I look forward to meeting you…and learning from you too! It’s a fantastic event for pet peoples to meet, mingle and learn from each other. I hope that one of these days I can make it also. So true! Hope you can attend sometime too! Aww, what a wonderful post! It brings back so many fun memories of my first (and so far only) trip to BlogPaws! It was a fantastic time. Congrats on being an ambassador! Thank you! It’s such an honor to be a BlogPaws Ambassador! It will be so fun to help welcome everyone to the conference and make them feel as at home as I felt last year! Such a cutie-pie doodle! I’m happy you found your purpose and inspiration at the conference. Awww…thanks! And thank you for stopping by to join us on our adventures! I’m getting so excited for the BlogPaws Conference! Joining this community was one of the best decisions I’ve made. The wealth of information that everyone shares just blows me away. From blogging tips to pet knowledge, I’m continually impressed by the conversations BlogPaws promotes. You said it well! The conference is the icing on the cake! Or the peanut butter on the Kong ball! I’m looking forward to meeting you at the conference in KC! Oh, my what a fantastic post and so sweetly told. And congrats again on being a BlogPaws ambassador! I wish I could meet you again this year, but I’ll be watching the live stream from afar! Last year was my first year attending BlogPaws and it was great! It looks like there is another amazing group of ambassadors. I am looking forward to going again this year. It’s great to hear that you had a great experience too! This year’s 10th anniversary conference should be a very special one. Hope to get to meet you! I am thrilled that you are one of our Ambassadors this year! You are a total rock star and will be so important and such a great resource for the speakers, as well as attendees and brands! Awww…thanks so much, Bernard! So excited to be a BlogPaws Ambassador and get to pay forward all the kindness that we’ve received from so many…including you! You were one of the first to follow us on Twitter when we started blogging just a little over a year ago! Thank you! This event sounds so amazing! I REALLY wish I could be there! My young kids are still in school so unfortunately travel is pretty much out of the question. I loved reading about your journey to blogging and how BlogPaws has impacted Your and Chloe’s life! What a blessing this organization is for all of us! So true! Wish you could come! Kansas City is family-friendly with…just sayin’ 🙂 Thanks so much for your kind words about our blog and our blogging journey. Grateful for BlogPaws and pet-lovers and pets! Soooo excited to work with you and see you in KC! It’s an honor to be an ambassador and get to work with you, Carol! Also, congratulations on being selected as a BlogPaws conference speaker! I’m looking forward to your session and learning more about affiliate marketing! See you in KC! I absolutely luved reading this Chloe Doodle & Miss Jenise! And Mom & I didn’t realize you used to work for Hallmark! We can’t wait to hear about your experience as Ambassador! I think Chloe needs an official hat! Purrs & luvs & keep up the furr-tastic work! Thank you, sweet Valentine! The hat is a great idea! It could say “Official Ambassa-doodle! Tail wags and take care!